Tap a Pic Set has colourful wooden pieces with holes drilled through them, so they can be held to the cork board with a metal tack. 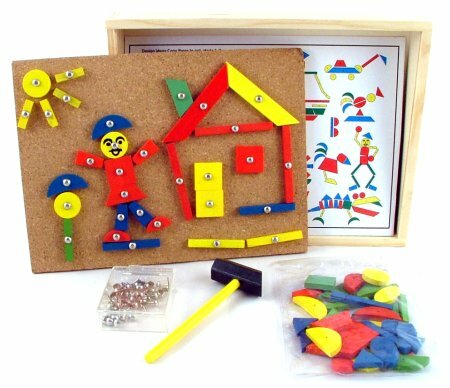 Over 50 pieces in various shapes and colours are included, along with the cork board, tacks and one little wooden hammer. This is a fantastic toy to help with those fine motor skills. It's really fun to create pictures from all the geometric shapes. You can copy the included pictures or make your own. The tacs have large heads so they are easy to hit and hammer or push into the cork. We like this because: "It's really fun being allowed to hammer in nails"